BioWare is nothing if not good storytellers. I think I said that right. Anyway, they once again proved it with their latest blog content. The story involves, indirectly, Jakarro and C2-D4. These are characters which appear in the Forged Alliances story arc (Part 2). They are quite entertaining so far. No real spoilers to follow, just a good story. Kern growled, thought about reaching for the blaster he kept holstered beneath the desk drawer. Something else crossed his mind; his hand went back to the bottle instead. “How about that crate of spice I paid for?” The bait to lure Jakarro and D4 hadn’t been cheap. Kern’s hand found a way to point his glass accusingly. “You’d know better than me.” He celebrated his wit with another swallow. “I don’t think it’s a crime to have a drink or two in my office!” Kern’s slurred words mixed with a chuckle. He tried to finish his drink, realized that his theatricality had flung the contents of his glass across the wall, and laughed even harder. “No, that isn’t a crime.” Kern didn’t see the droid’s arm move. He only saw the flash of light, and found himself suddenly staring at the ceiling. Glowing eyes came into view, loomed over him. The ringing noise faded, replaced by the sound of a carbonite pump rumbling into action somewhere in the droid’s innards. Limbs refused to move. Imitation is the sincerest form of flattery, right? As you may or may not know, Sites with Benefits uses an optional Twitch IRC bot to reward points as people watch the stream. One of Sites with benefits users asked for the ability to have viewers request and play songs in exchange for points. Nightbot, the most popular (I think) Twitch bot already has this functionality. So I did some reading and learned enough to guess how they did it. Basically, they use a website to play the youtube videos in the background. Since Sites with Benefits is web-based, I did the same. Viewers can now queue up songs through the Twitch bot. They are sent to a special server page which the streamer has open. The page automatically plays the youtube videos in the background and voila, song requests are in. It was a fun project, even if it only took me a few hours to implement. As always, if you want to use Sites with Benefits drop me a line and I'll get you all setup. On my third Gatekeeper Cartel Pack, I got a Canyon Bantha! Bantha > Rancor. I'm a bit too happy about this. I've been wearing the same armor in SWTOR for a while now. Thanks to their modular system, you can keep the look you like pretty much forever. I was wearing Tionese and Columi gear, which I thought looked pretty good. I figured it was time for a bit of a change. So I switched out a couple of pieces, changed my base color from green to red, and got myself a new assault cannon. Gear customization is on of the more underrated aspects of SWTOR. I really like that you can move set bonuses in between gear as it really opens up the possibilities. I'm mostly using Obroan PvP modules to gear up. While it won't get me into any Hard Mode Operations, it should do just fine in Story Mode, and PvP. I also decided to change up my spec. I mostly played a Medic Commando, but I was in the mood to do some damage. So I changed my skill tree to Gunnery. I'm still sporting my Medic gear though, as I just don't have it in me to try and get two sets of gear. I don't Role Play much anymore, but it is hard to leave those tendencies behind. I used to play MUSH's quite a bit, and have always had an active imagination when it comes to games. I try to do what makes sense in the context of the game world. For example, I'll never have an outlandish name. It'll actually be a name. So I am having some issues when it comes to SWTOR and Galactic Strongholds. I get 5 rooms on Nar Shaddaa for free, so I was going to make that my primary stronghold. Theme wise, I was thinking it would be a Republic base of operations, as my main is a Trooper. That's great, lots of fun to be had with that theme. Strongholds are legacy wide. So it makes no sense for my Imperial characters to ever visit my Republic base of operations. I really wanted to concentrate on a single stronghold, so that kind of leaves my Imperial characters out in the breeze. My main Imperial is an Agent. I could get the 'cheap' Kaas City stronghold and use that for that side of my legacy. However, an Imperial base of operations would make more sense on Tatooine rather than in an apartment. I just can't see myself paying for that at the moment. I suppose I could just come up with a different theme for my initial Imperial stronghold. Maybe a secret agent house. However, why would my other characters be hanging out there? Although they are in the same legacy doesn't mean they all hang out and have drinks. I ain't got time to bleed. Errr, something like that. 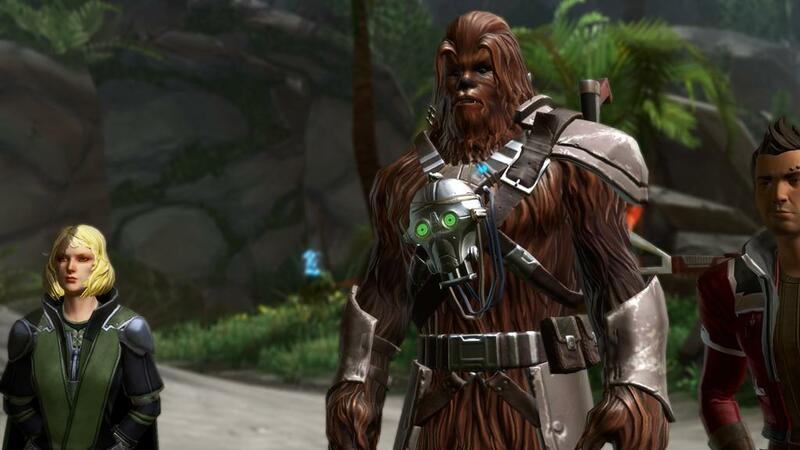 Anyway, the Rakghoul Plague event has returned to SWTOR. It's taking place on Tatooine. One thing I like about the way BioWare does some of their events is the atmosphere. There is a neat news broadcast to introduce the event. Then when I got to the planet, you could hear Rakghoul warnings on the PA system. Sadly, I just don't have time to participate in the event at the moment. I'm currently focused on doing CZ-198 dallies so I can get my reputation to Friend level. That will open up some housing items which I want for my Nar Shadaa stronghold. Since the event is made up of dallies, I'm all full up at the moment. I can only handle so many dallies. Maybe this weekend I'll get some more time and see what it is all about. I'm not too concerned though as T.H.O.R.N. ( the reputation you earn ) doesn't really have any housing decorations I really want. Won't this look cool in my Trooper's HQ? Image courtesy of TOR-Decorating. I happen to have a $20 Steam Gift Card sitting next to me. The poor guy is looking for a good home. That means it is time for a giveaway! We'll be using my Sites with Benefits tool to do it. It's easy to enter the drawing. On the right side of the screen is the Sites with Benefits tab. Use that and Sign In. Then do as many of the missions as you want. Use the points to buy raffle tickets. The drawing will be Sunday, August 10th. If you are interested in using Sites with Benefits, drop me an email (in the sidebar) and I can get you all setup. Good luck!